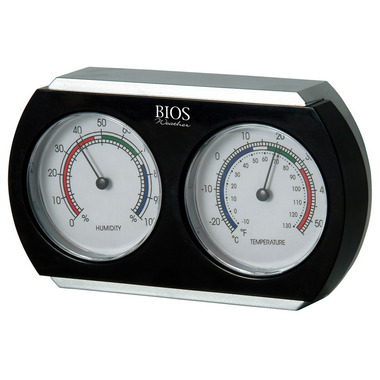 Bios Indoor Thermometer & Hygrometer is the perfect way to keep a comfortable humidity range in your home. Picture as depicted. Easy to use. Reasonable price/quality for a basic product that seems pretty accurate in both its function as a thermometer and hygrometer. I use this in my baby's room. I'm thinking that it seems accurate enough. I love that it's small enough and super lightweight. I've been using this mostly as a hygromoter to make sure my home is reasonably humid (due to the dryness of heating systems). It works well but it takes a while to measure the humidity. I tried putting it in the bathroom after I showered and it took a while to "catch" the humidity that was in there. If you need instant reading this is not the best product for you. But if you are ok with waiting 10-15 min I would say go ahead and buy it. I love this thermometer/hygrometer. It is simple, accurate, easy to read and best of all - no batteries. It is perfect to keep an eye on humidity levels in the house, especially in the winter, and also in my sunroom where I keep the plants. It can be set on a ledge somewhere or hung on a wall either vertically or horizontally.